London, UK – 14 May 2012: Several rule changes have been confirmed for the 2012 Alpari World Match Racing Tour, coming into effect at the first event of the season, Match Race Germany in Langenargen on May 23 – 28. The Racing Rules have been amended in order to continue the positioning of the Alpari World Match Racing Tour (AWMRT) as the most compelling, competitive and pioneering action on the water. Craig Mitchell, Alpari World Match Racing Tour, Tour Director, expects the alterations to have a positive effect on the Tour, as well as match racing in general: “Match racing has evolved to the point where we currently have a great set of rules, producing some fantastic sporting action, as we saw quite clearly in the 2011 series. Following the decision by the America’s Cup to move away from monohull sailing and subsequent revision of their rules, organisers at the Alpari World Match Racing Tour began a re-think of the rules, inviting comment from sailors and event organisers to establish what, if anything, they would like to see changed for the 2012 season. The resulting discussion paper identified a number of areas which were generally agreed to be open for experimentation and ultimately permission was given by the International Sailing Federation to implement the final decisions under RRS86. Several changes have been included in order to tidy up existing wording and define certain aspects more clearly but amongst the slightly more controversial additions are a revision of the penalty process, limiting boat requests for redress and an amendment of proper course restrictions which it is hoped will allow the trailing boat increased chances to overtake – expected to get a mixed reaction amongst sailors and sailing aficionados alike. The major change in the penalty process for 2012 is the removal of double penalties for serious rule infringements. It was felt the old process tended to ‘kill-off’ a match and officials will now award a red flag instead of a double penalty, for which the infringing team will need to take an immediate penalty turn. Should that same team still be in control of the match after the turn, umpires can award another penalty. A boat finishes when any part of her hull crosses the finishing line in the direction of the course from the last mark after completing any penalties. 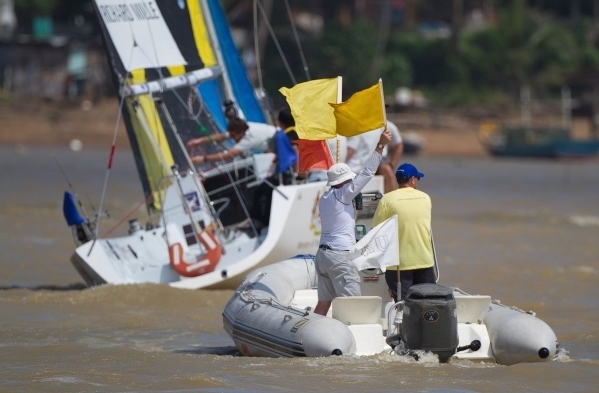 However, when penalties are cancelled under rule C7.2(e) after one or both boats have finished each shall be recorded as finished when she crossed the line. C2.14 Rule 17 is deleted. C2.16 Rule 31 is changed to ‘While racing, neither the crew nor any part of a boat’s hull shall touch a starting mark before starting, a mark that begins, bounds or ends the leg of the course on which she is sailing, or a finishing mark after finishing. C6.3 A boat may not request redress under RRS 62.1(a). The protest committee may decide to consider giving redress under that rule if it believes that an error has been made. The race committee or match umpires may request the protest committee to consider this. This changes RRS 60.1(b) and 62.1(a). A boat intending to request redress under 62.1(b) or (c) because of circumstances that arise before she finishes or retires shall clearly display a red flag as soon as possible after she becomes aware of those circumstances, but no later than two minutes after finishing or retiring. C6.5(b) The red-flag penalty in rule C5.3 shall be used when a boat has gained a controlling position as a result of breaking a rule. Add new C7.2(a) and change current C7.2(d) then renumber all points. C7.2(a) After being signalled under rule C5.2 and within the limitations of rule C7.3, a penalized boat may elect to take a penalty immediately by crossing behind the stern of the other boat. C7.2(e) A penalized boat shall not be recorded as having finished until she takes her penalty and sails completely to the course side of the line with her hull and then finishes, unless the penalty is cancelled before or after she crosses the finishing line. C8.3(a) retained a controlling position after taking a penalty under C7.3(d). C8.3(b) gained an advantage after barging at a starting mark when approaching the line to start. C10.2(b) When one of the boats in a match fails to sail the course in accordance with rule 28.1, she shall be scored DNF without a hearing. ← 18 ft Skiff Pitchpole at European Grand Prix in Hungary 2012.